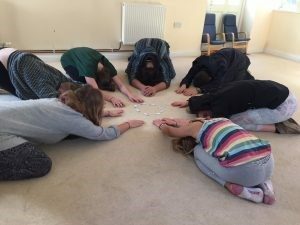 One of the groups working together in WYRED in the UK has a focus on yoga. This group originally formed as a result of an invitation to one of their members to talk at a conference on yoga in education. Together with the organisers, she brought together a group of young people, and they began a process of conversation around yoga, education and society, and the different issues that they as young people are concerned about. This took place in a series of dialogues over a weekend in Bath in October 2017. They identified a range of issues that concerned them these included substance abuse, creativity, anger issues and others, but the most important shared concerns were the state of education, the state of the environment, and issues relating to mental health. As the group shared an interest in yoga they focused their thoughts on how yoga might be used in each of these contexts. Over the course of the weekend they decided to start by putting together a group presentation to the conference, of one hour, in which each talked about their own personal reasons for coming to yoga, in many cases related to the concerns identified, and spoke also about their overriding concerns. One of the key outputs was a vision for yoga in schools so that more young people can benefit. Moving forward from that initial experience of dialogue, groupwork and subsequent presentation to the conference (110 participants) in London, the group has plans for various activities. One of these builds on the work already done by one of the group members who has implemented a survey of attitudes to yoga in her school. One of the key obstacles to further spread of yoga is attitudes among those who don’t have direct experience of the practice. They aim to develop this survey and extend it to other schools in the UK but also take it into the WYRED international community, in translation, to find out international attitudes. In January 2018 the group is coming together again to continue their project and discuss the next steps, both locally and in the WYRED international space. In November 2017 one of the group was invited to an All Party Parliamentary Discussion on Yoga at the UK Parliament and the aim is to build on that, as well as explore other possibilities. We will post again when they have discussed their next steps. The group is called Team Bliss. Any young person who wishes to join is welcome to participate.